Here I am again with another post entirely dedicated to my love of a Zara dress. What can I say? They do them so well! Just like the white button down dress I was raving about earlier in the summer, this beautiful new season emerald green number is priced at an incredibly reasonable £29.99, and so wearable that you are sure to get your money's worth out of it in no time at all. If you're anything like me, that alone is reason enough to add to basket, but this dress has so much more going for it than that. 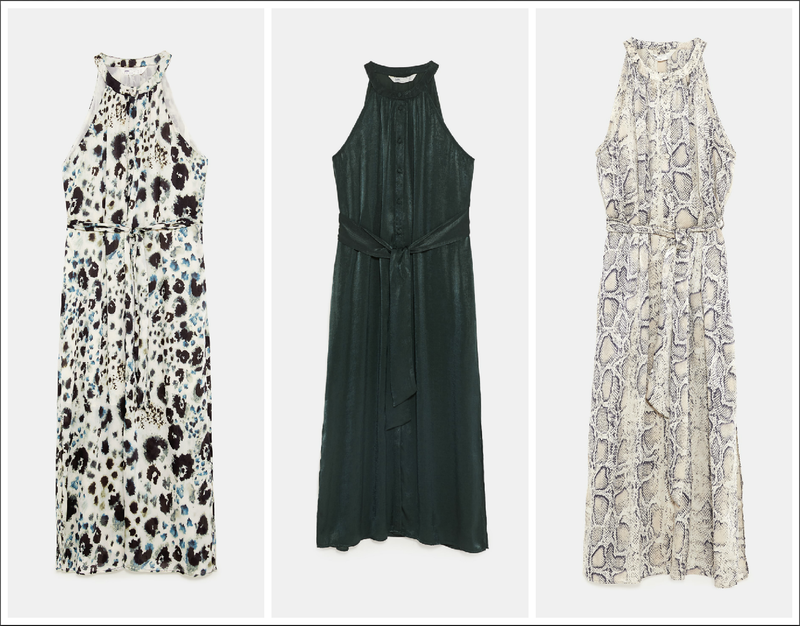 So, just in case you are in the mood to be enabled, here are 5 more reasons to buy this gorgeous Zara halter neck dress. 1. It's An "All Year Rounder"
As you can see from my photos, not to mention my ongoing Instagram spam, I took this dress with me on my recent holiday to Mallorca. Paired with some metallic sandals and a delicate necklace, it was the perfect, easy breezy piece to slip on for those balmy Mediterranean evenings spent dining under the stars. (Aargh, take me back!) Yet the rich colour and sumptuous silky fabric make it more than well suited to the transition into autumn too - it is, after all, part of Zara's new season collection. I can see this working equally well with some sleek stiletto boots and a tailored blazer. At the risk of sounding like an old person, haven't man made fabrics come a long way?! This dress is 100% polyester, which doubtless accounts for its affordability, yet it really does look and feel as though it's been made from silk. Add to that the chic, effortless cut and flattering tie waist and side splits and you have a dress that totally belies its under £30 price tag. In addition to working equally well as a summer or autumn piece, this has so much versatility when it comes to styling, too. I find it suits me best with the neck worn open, but you could also button it all the way to the top and wear your hair up for a completely different look. A sleek pair of heels would definitely add some glam, and you could swap the tie belt for something that makes more of a statement. To take it down another route entirely, if you are cool enough (I'm not! ), you could add a slouchy sweater over the top and team with trainers, or wear it unbuttoned over jeans. I don't know what it is about pockets, but I know I'm not the only one who feels like the cat that got the cream when I discover them on a dress or pair of trousers I love. Pockets are like the icing on the cake! I've omitted to demonstrate them here, but rest assured this dress comes with pockets so that you can pose up a storm for Instagram have somewhere handy to put your handkerchief. I fell in love with the emerald green dress, but if it's not your thing, it's also available in two lovely animal prints. The printed versions are a little more expensive but still a very reasonable £39.99. I am sure that they will both prove to be very popular, given the current demand for all things animal print! Have you been buying anything for the new season yet? Love that it comes in leopard and snake print! Gorgeous! Even though I am a huge fan of animal print, I think I would go for the emerald green version in this dress. It is just such a pretty color! It has pockets? Say no more!! All three versions are really great, but I am much more drawn to the snakeskin print. My favorite reason for buying this dress is the fact that it has pockets! Lol. If you go to my page you'll notice the last dresses I've worn have pockets! Lol. I really love your page! How do I follow you through blogger? I love Zara, but for some reason, I haven't shopped there in a while. This dress looks so beautiful on you, Kate- love fun and versatile pieces like this one! Gorgeous! What a lovely dress. Oh what a gorgeous dress and I love the color!